WHOLE-WHEAT RAISIN! Yum. Delicious toasted with some butter for breakfast. Also nice with cream cheese. PB&J? Why not? alright! so stoked! 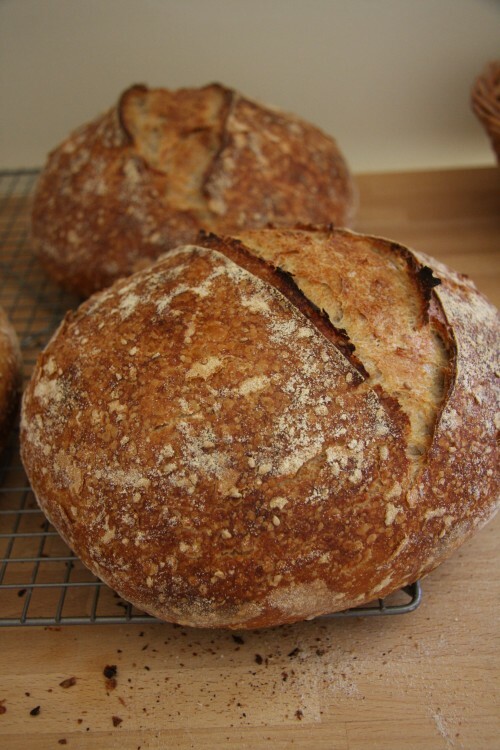 Bakester has been featured in the Portland Monthly magazine…..
It’s Friday again, that means it’s bread day! This week I present you with a sesame loaf. 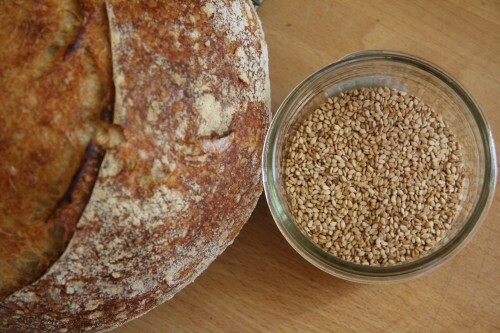 It’s studded with tiny little perfectly toasted sesame seeds and is so nutty and delicious. I can’t wait to get it into your hands. I’m running a little late this morning after somehow dropping my telephone into my glass of water that was on the floor by my bed last night. I’m still on the hunt for the “perfect” night stands and have been using the floor in the meantime. Anyway, I went to set the phone down and PLOP, in it went into my water glass. It was my alarm clock so I had to use my husbands phone as my alarm clock instead and go figure I set it up wrong and it didn’t go off at all this morning. I slept in til seven and now I’m an hour and a half behind! I’ll be delivering out-of-order this morning and will leave all the subscribers who I know won’t be home until last. Sorry for the delay! 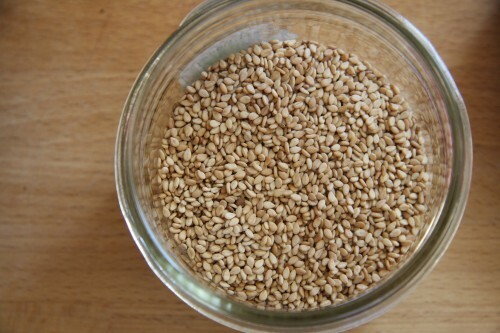 Sesame seeds always make me think of the comedian Mitch Hedberg…..
It’s better live if you can find it on youtube or something, I highly recommend it. hilarious. In other news I made pizza last night with my bread dough (minus the sesame seeds) and it may have been the finest pizza I have ever made or eaten. 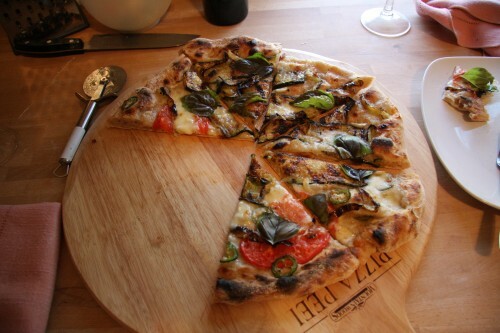 I wish this type of pizza traveled better cuz I’d make you some. When my husband and I lived in Humboldt County, California we would often get together with some great friends for pizza and cosmopolitans. Our friends made THE BEST cosmos and by the time we were ready to eat we were all so drunk off one cosmo we would over stuff ourselves full of grilled pizza until we were totally uncomfortable. ::think stretchy pants on Thanksgiving full:: It was worth it. That pizza was amazing but this pizza tops it for sure. Dang, I love bread and I llloooovvvvvveeeeee pizza. 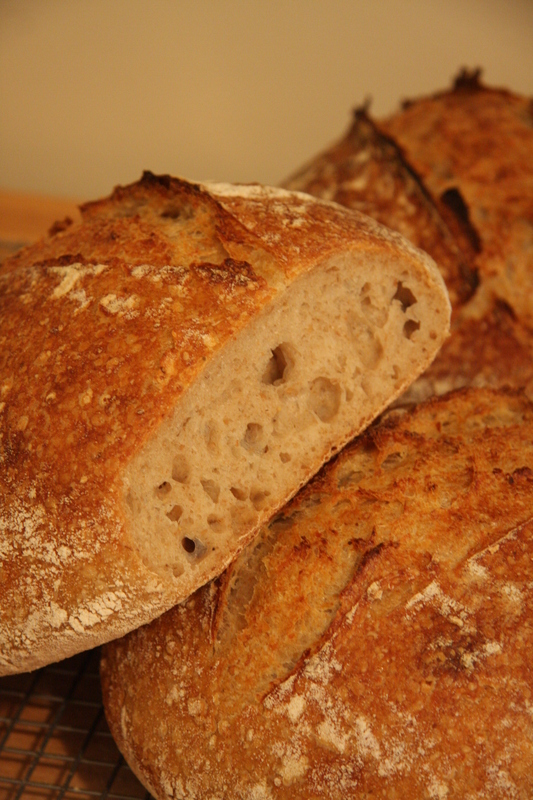 Anyways, I’ll be out the door soon enough with bread coming at ya. Have a great weekend everyone and seriously, let me know how you like the sesame bread!! Once upon a time there was a sweet gal named Laura. Some folks called her ‘the bread lady’. Way back in the day the bread lady was just learning how to bake bread and like a silly little gal she was, she wanted to skip the easy recipes and go straight for the ones that were complicated and far more advanced than her bread skills could take her. 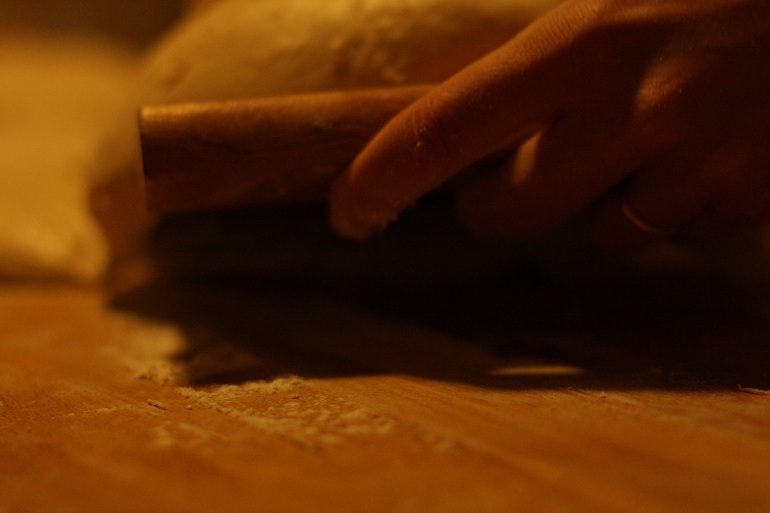 She had not yet mastered a single simple country loaf and there she was trying to make a polenta rosemary leavain. Oh course said loaf of bread came out doughy, under-baked, under-proofed and heeeaaaavvvyyy. Ummmph. The bread lady didn’t have a clue where she went wrong, following the recipe to a T, and blamed it on the recipe itself. The bread lady has come a long way. Luckily, there was no photographic evidence of this miserable looking, inedible loaf. If there is not photographic evidence, who is to say this story really happened? 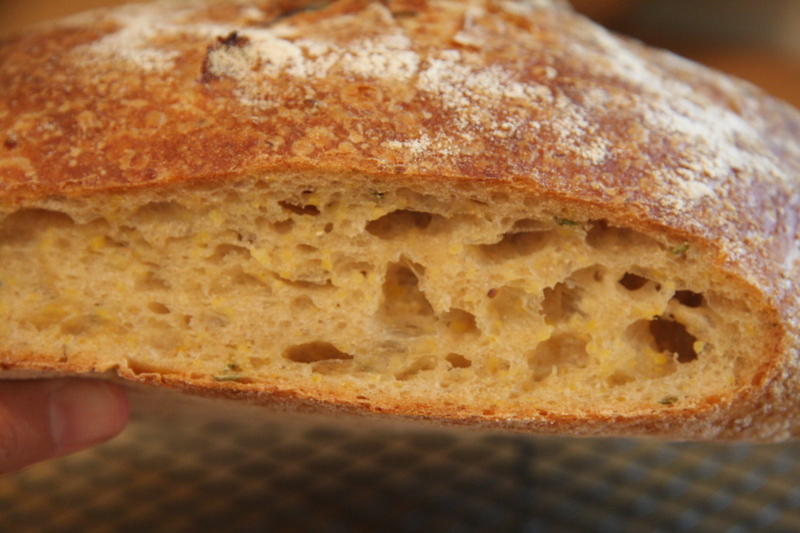 The bread lady made that same polenta rosemary levain loaf today, kinda nervous about a similar experience happening. She was still half convinced that it was the recipe that was at fault, and not her lack of baking skills oh so long ago. (still in denial, jeeeez!!) She didn’t really want to just wing it and not have it come out. How embarrassing would that be if she had to inform all you bread lovers that well, sorry, no bread this week because it was an epic FAIL. Well people, the loaf came out AMAZING and the bread lady can’t wait to share some with you all this week. She’s getting up CRAZY early Friday morning to bake for y’all so she really hopes ya like it a lot. This photo is silly with only one slice of bread cut away. The bread lady resisted the urge to eat the whole loaf of bread this morning and succeeded. She did want to show you all the bitty polenta bits floating around though. Yep, crazy good! do you see the bitty bits of polenta? Anywayz, on Friday, go buy yourself some good slices of turkey or chicken breast and pretend it is the day after Thanksgiving and make a big fatty sandwich with this bread. You won’t regret it! 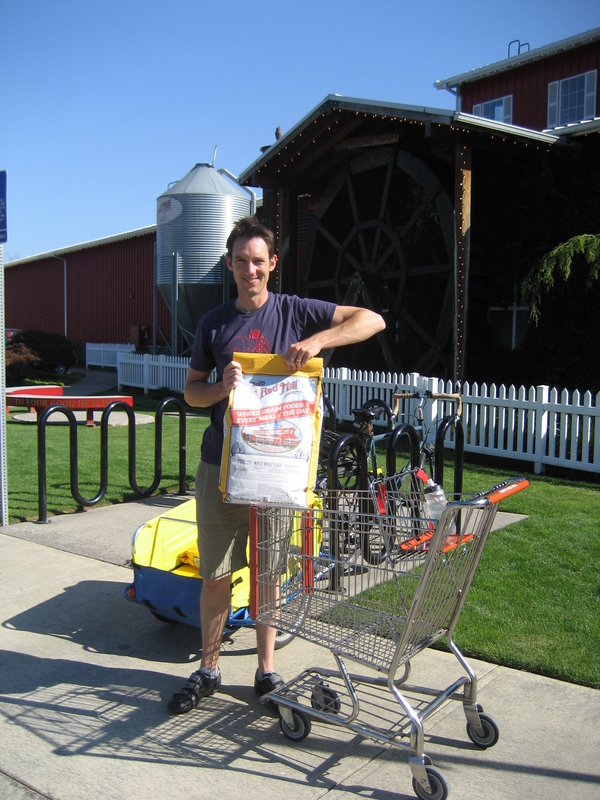 He’s my ridiculously sweet husband who volunteered himself this week to ride his bike with a trailer down to Milwaukie and buy bread flour with me from Bob’s Red Mill. He then rode his bike back with said trailer with 50 pounds of flour behind him. That is over 15 miles of riding! Now if that isn’t love I don’t know what is! He’s dedicated and supportive of my bread venture and is willing to do anything to help me out. I have to say that the most wonderful part of this whole experience so far has been delivering bread to all of you, especially the ones that answer the door still sleepy eyed in their PJ’s so darn excited about about my bread that it makes me giddy. I also love when I can hear from inside the house, “hey, honey, guess who’s here! ?” Yep, it’s me, the bread lady! I enjoy making y’all happy with warm loaves of bread. My husband Mike is so dedicated to my bread venture he keeps saying that he’d like to deliver the bread. I might be the bread lady but Mike is the bike guy and he loves the idea of bread delivery by bike. I’m not so sure I’m ready to party with that yet because every Friday YOU MAKE MY DAY when you open that door that greet me with excitement and enthusiasm. It makes waking up at 5am to turn the oven on sooooo worth it. Thanks people! And thank you Mike, I love you bunches and then some. Isn’t she gorgeous? I just snacked on a piece and I can vouch for its tastiness too. We’ll, let’s see, it’s got wheat, rye, triticale, oats, oat bran, barley, rice and flax meal. Yep, it’s chock full of sweet nutty grains yet still light and fluffy on the inside with a chewy crust. What can I do with this bread? First off, you can just eat it by yourself alone in a room and not share it with anyone else, because clearly there just isn’t enough to go around. Seriously, I won’t judge you. Or you can use it to make really delicious sandwiches. It’s summer, so go get yourself a really ripe local tomato and call it a day. Have you ever tried grilled bread? I like to take day old bread, rub a little olive oil on it and throw it on the grill with an assortment of veggies (or meat). 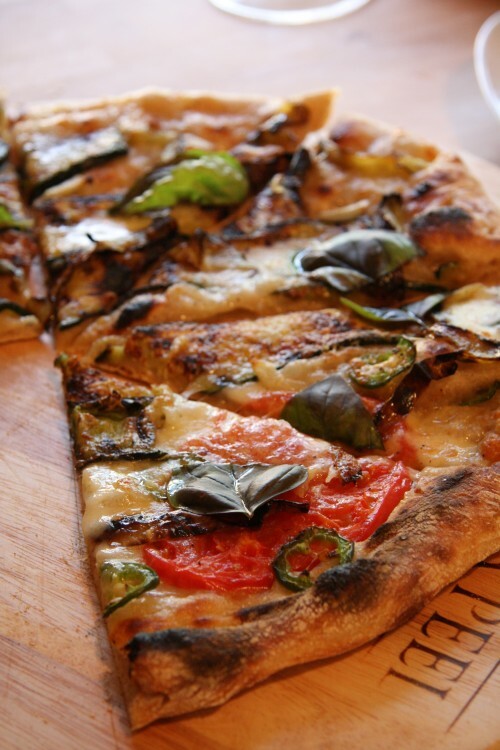 I rub a piece of raw garlic on the toasted bread and top in with pesto, eggplant, zuchini…..the options are indefinite! Hope you enjoy it, see you all in a couple of hours…. 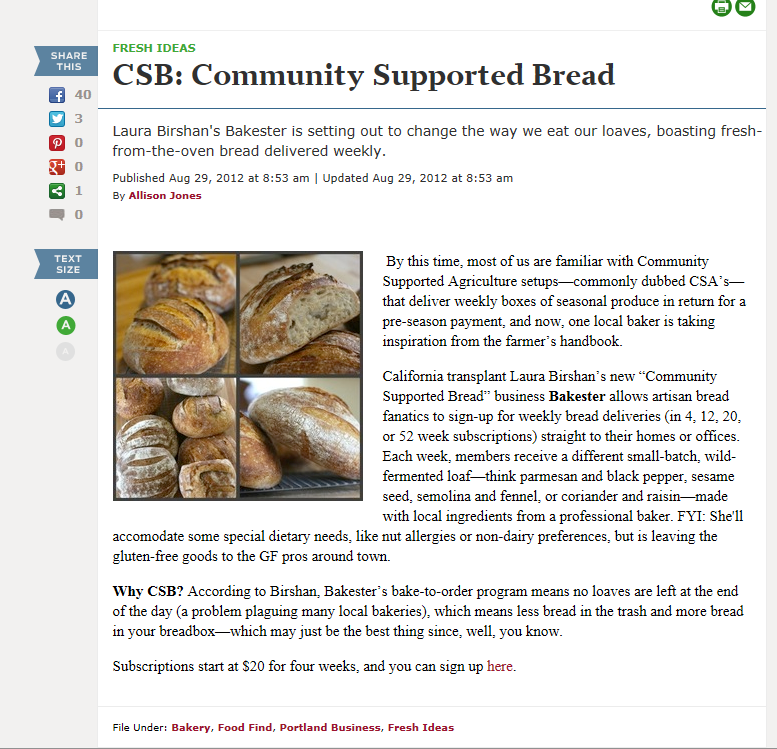 Bakester CSB got it’s first little bit of publicity yesterday. Makes me happy and proud. Go Bakester CSB! I’m a tad late posting this week. I’m baking bread as I write and boooooyyy does it smell good in here! 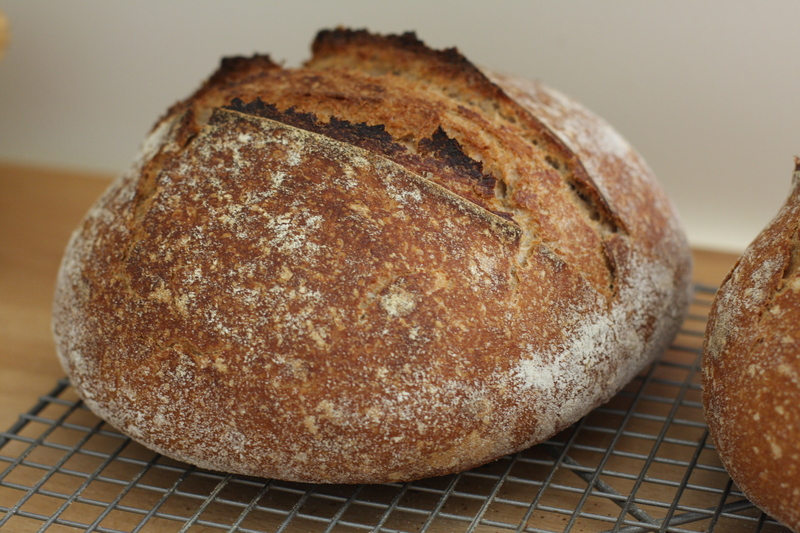 This weeks bread is a hearty whole-wheat loaf. This is my absolute favorite bread toasted with salted butter and a sharp piece of English cheddar. I also really enjoy it with a fried egg with runny yolks. 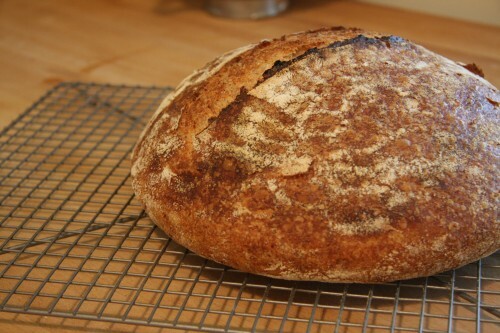 It’s a pretty all-purpose bread, nothing fancy. But it’s delicious, I promise! I’ll be out for delivery in a few hours and I’ll get to see all your pretty faces soon.